The University of Montevallo is a public corporation and instrumentality of the State of Alabama, created by the statutes of Alabama, now presently codified as Sections 16-54-1 et seq., Code of Alabama 1975, as amended. The Board of Trustees (“Board”) is the governing body of the University of Montevallo (“University”) and establishes Board Policy, secures the financial resources to support adequately the University’s programs, selects the President of the University, and approves the University budget. The Board authorizes the University President to develop and implement “policies and procedures required to administer effectively the operations of the University” (Board Policy 01:001 §9). Policies adopted by the Board of Trustees. In general, Board Policies are statements usually dealing with broad university-wide issues that guide Board and Administration action. Policies and procedures adopted by the President pursuant to Board Policy 01:001 §9. 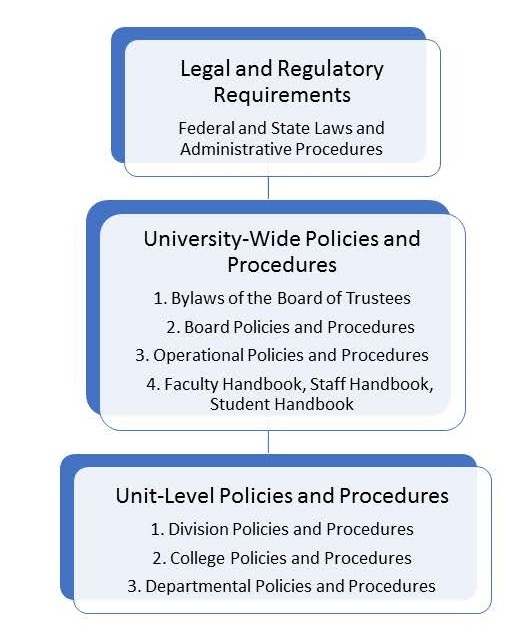 University Policies and Procedures are university-wide in scope, but are aimed at carrying out the President’s charge to ensure the effective administration of day-to-day operations at the University. The President has delgated authority to his Executive Cabinet to adopt Operational Policies and Procedures that are administered by their Division.